Full weekend tickets. Friday, Saturday and Sunday. Anyone under the age of 18 must be accompanied by a parent/guardian over 25, there is a maximum of four Youth/Child tickets per Adult. ID may be required on entry. Ages 18+. Early worm tickets, beat the early birds and put Samphire 2017 in the diary. Ages 18+. Early Bird tickets, get Samphire 2017 locked in. Age 18+. 4x Adult tickets, get your mates on board and save enough for a few pints each! Student discount of 15%. 18+. MUST have a valid student ID card on entry, eg NUS. Ages 13-17. Youth ticket holders must be accompanied by a parent/guardian over 25. Maximum of four Youth/Child tickets per adult. Ages 5-12. Child ticket holders must be accompanied by a parent/guardian over 25. Maximum of four Youth/Child tickets per adult. Ages 0-4. Child ticket holders must be accompanied by a parent/guardian over 25. Maximum of four Youth/Child tickets per adult. Saturday & Sunday ticket - entry to the festival on both days. 18+. Limited availability Saturday & Sunday ticket. Entry to the festival on both days and camping on the Saturday night. Super Luxury Tipi - Sleeps up to 6. As the Luxury Tipi, but the mattresses come complete with fitted sheet, duvet, duvet cover and four pillows with pillowcases. The king of luxury camping. Does not include festival tickets. The best pad on site! A badass tipi with a badass view! Regular Tipi - Sleeps up to 6. Unfurnished, finished with a liner, groundsheet and coconut matting floor - a fab roof over your head all you have to do is bring something to sleep on! Tickets not included. Super Luxury Lotus Belle - Sleeps 2. As the Luxury Lotus Tent; but the mattresses come complete with fitted sheet, duvet, duvet cover and four pillows with pillowcases. Tickets not included. Luxury Lotus Belle - Sleeps 2. Finished with Cotton/wool rugs, plenty of scatter cushions, low table with lantern and T lights provided, two chairs, rubber doormat in doorway and waste container and memory foam mattresses. Tickets not included. A mega lush weekend home for two. Parking ticket for the camper van field. A back to basics party with jaw dropping sea views. Tucked away on Exmoor National Park this is a festival for music lovers, food lovers, adventure lovers and party lovers too. A selection of over 50 of the UK's best live and electronnic acts - Award winning street food - The Club House immersive games and drama - 5am finish - Talks & films - Exmoor Adventures - Family friendly - Kids activities - Yoga & healing - Lots of dancing! Fancy dress encouraged - anything from the box accepted! 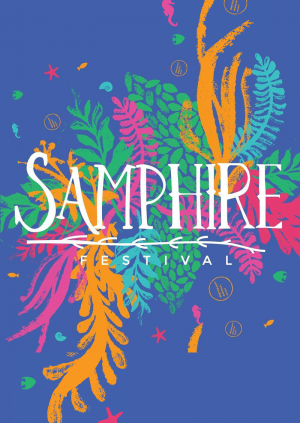 To ensure tickets are delivered safely and securely and to keep the price as low as possible for you, the ticket buyer, Samphire Festival generally uses our E-ticket system unless otherwise stated. When you purchase tickets through Samphire Festival, the full face value of the ticket is shown. This price is the price set by the event promoter and we pay this full amount to the promoter without any deductions.